Leon’s unique blend of essential oils and sweeteners with his take on some old skool flavours make these as the name suggests a bit special. 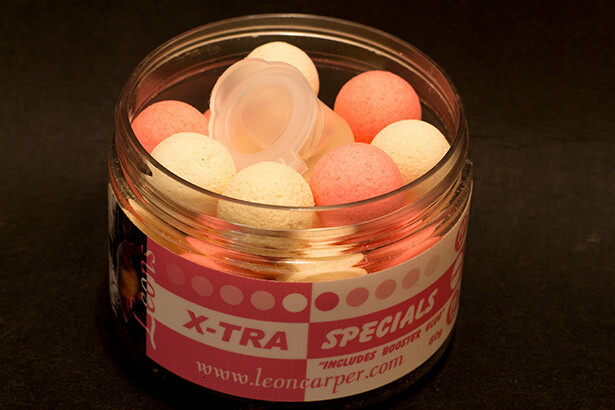 The washed out pink and white that come mixed in a tub are perfect and seem to be the colour of choice for many an angler. When we first recived the pop ups an HQ we did the ever usual practise of shaking the tub opening and taking a deep breath in. It was clear from that point onwards that Leon had thought outside the box on these and had gone and done things his way. There is no specific “flavour” to these as the blend of sweet and almost spicy pepper aromas take me back to when I can remember dad rolling baits in the kitchen. With the addition of the included booster liquid these pop ups are a clear winner. What also makes these pop ups so great is the fact that they hold for days. We had the 16mm on a overweighed chod section for 6 days with zero drop. At £9.99 delivered for two pots these also represent outstanding value for money. So if your looking for something special to put in your bait bucket then have a peek at these cracking pop ups from Leonh some fish. .